If you recently had a positive home pregnancy test, scheduling your first prenatal visit is the next step. Having prenatal care is vital during pregnancy in order to ensure that both you and baby are healthy. The first visits are typically the longest and most in-depth, as your doctor goes over a lot of information about your pregnancy and the health of you and your baby. After your first prenatal visit, expect to be visiting your doctor every four weeks or so. Your appointments will become more frequent (sometimes even weekly) towards the end of your pregnancy. The total number of prenatal visits will depend on your individual needs and any pregnancy complications or medical issues you may have. What do I need to do to prepare for the first prenatal visit? You can maximize your first prenatal appointment by providing your doctor with some important information. Before you arrive, write down a list of questions you have for your doctor, especially if this is your first pregnancy. It can be easy to forget all the things on your mind during this exciting time, so notes can help you remember your comments and questions. 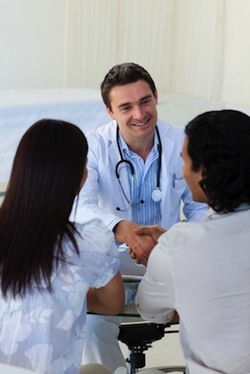 In addition, you’ll need to provide your doctor with your medical history and your family’s medical history. If you don’t have that information, contact a relative who knows lots of information about your genetic history. It is also helpful to have medical information from your baby’s father’s side of the family. What will happen during the first prenatal visit? During your first prenatal visit, expect to answer a lot of questions about your emotional and physical health, stress level and lifestyle. Your OBGYN will give you an approximate due date based on your last period or ovulation date if you were actively trying to conceive and have this information. The due date helps your doctor keep track of your baby’s growth throughout your pregnancy. Your doctor will also perform a physical examination, which includes checking your blood pressure and recording your height and weight. A vaginal ultrasound may or may not be done during the first visit. If you haven’t had a gynecological exam in a while, your doctor will look at your cervix during the visit as well. Expect to take a number of tests during your prenatal visit. These include a urine test to verify your pregnancy hCG levels and to look for any infections; blood tests will also be done to check your blood type, hemoglobin, immunities and beta count. How often do I see the doctor in the first trimester? During the first trimester, you’ll have two to three prenatal visits. Throughout your pregnancy, you see your doctor about every four to six weeks, unless you’re considered high-risk pregnancy based on health or previous pregnancy complications which may necessitate more frequent prenatal care visits. The first trimester is equally nerve-wracking and exciting. By visiting the doctor regularly for your scheduled prenatal visits, you will feel more comfortable knowing the pregnancy is progressing well.